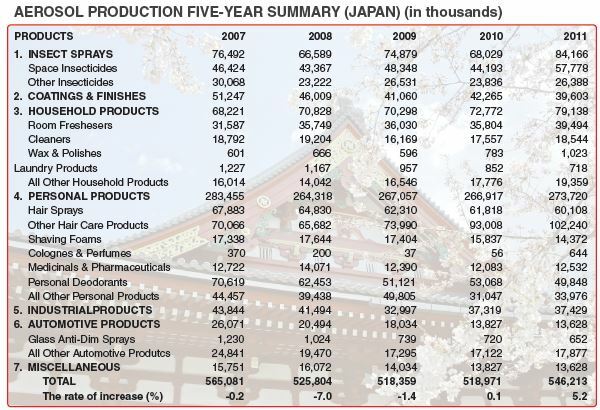 The Board of Directors for the Aerosol Industry Association of Japan (AIAJ) met in April and announced production figures for 2011. According to AIAJ, the estimated number of units filled in 2011 (January to December) is 546,213,000, an increase of 27,242,000 units (5.2%) over 2010. Although the earthquake of March 2011 in northern Japan caused a lack in supply of raw materials, seasonal summer products such as Insecticides, Refrigerant Sprays, Air Conditioner Cleaners, Insect Repellent Sprays, etc. experienced strong sales. Insecticide production saw a 23.7% increase, while Room Fresheners experienced a 10.3% increase. Cleaners increased 5.6%, as did Other Hair Care Products (9.9%), medicinal/Phar-Production jumps more than 5% in 2011… maceutical (3.7%) and Lubricants/Rust-Inhibitors (2.3%). Paints saw a 6.3% decrease, as did Hairspray (-2.8%), Shaving Foam (-9.3%) and Antiperspirants/Deodorants (-6.1%). Insecticide sales increased in 2011 because space insecticides, especially small, meter-dosed and content-rich formulations, grew sharply. The filling of small containers (less than 50cc) tripled (approximately 6,450,000 units were produced in 2011). Roach sprays decreased slightly, but other bug sprays had increased sales. Paint sales decreased due to a decline in demand for home use. 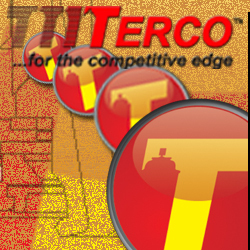 In the Industrial Products category, Lubricants/ Rust Inhibitors recovered from a long-time decrease after the “Lehman shock” of 2008. However, Automotive’s Air-Conditioner Cleaners experienced strong sales. There were many new launches of Room Fresheners in the Household Products category, while Air Conditioner Cleaner production and sales also increased. Sales of All Other Household Products increased as a result of “Clothing Refrigerant Sprays” (fabric coolers) becoming a hit, while Japan’s most popular Glass Cleaner brand was redesigned. Tonic Spray was redesigned. On the other hand, Hairspray sales decreased due to an overall slump in the styling agents’ market. In the Other Personal Products category, Medicinal/Pharmaceutical sales increased due to a new athlete’s foot remedy. 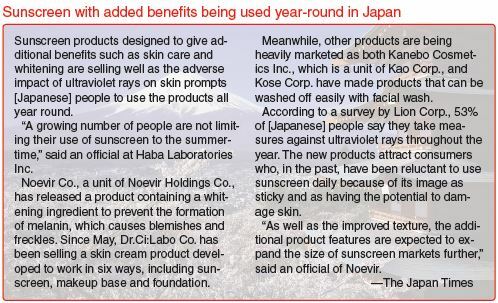 Insect Repellent and Sunscreen sprays also had strong sales. The Shaving Foam category decreased due to the increase of imported goods. 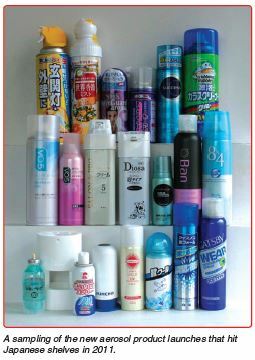 Antiperspirants/Deodorants decreased because of competition from non-aerosols.